Nowadays, by choosing Coppini Olive Oils, you choose a completely Green world! 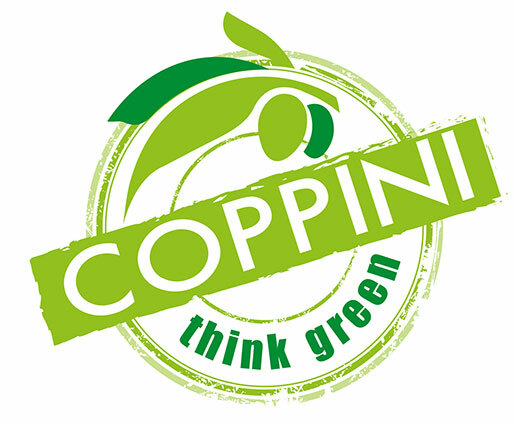 With the new line Coppini Think Green, the Company moves on to taking other pollution-reduction steps. It chooses a 70% recycled glass bottle, thus reducing CO2 emissions, and FSC certified labels. Moreover it solely uses boxes which are lead-free, mercury-free, cadmium-free and without hexavalent chromium and that do not contain any flame retardant, harmful for the environment. Caps are made of alluminium and plastic and are 100% recyclable, and LDPE collation shrinking film is made of 50% recycled polymer. In our Company, the Passion for Quality, the Values ​​of Tradition and Modern Technology have kept the crisis away. With these guidelines we have had a remarkable growth over the last six years: every day the Team Coppini works with seriousness and determination to ensure the highest quality standards. For the President, Mr Angelo Coppini, Quality is a firm and constant idea that pursues with every company’s business: from the selection of the best national and Community oils to the most scrupulous implementation of food hygiene and training regulations of the staff; From the utmost respect for the environment, to the production and use of environmentally sustainable energy for the needs of the Company. In fact, the installation of a modern photovoltaic power plant of 185.75kw is located on the roof of the building. An investment that Mr. Angelo Coppini, very sensitive to ecological problems, has supported with pleasure to optimize the company’s economy, reduce air pollution and contribute to a lower dependence on Italy on hydrocarbons. We are very pleased with the realization of this investment because choosing a source of clean and inexhaustible energy as the sun, saving on the bill, we will be protected against the future increase in energy costs and will protect our territory.